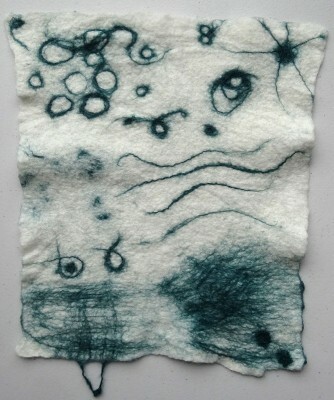 I was delighted to read yesterday that one of my favourite feltmakers, Elizabeth Armstrong, has just published a book. 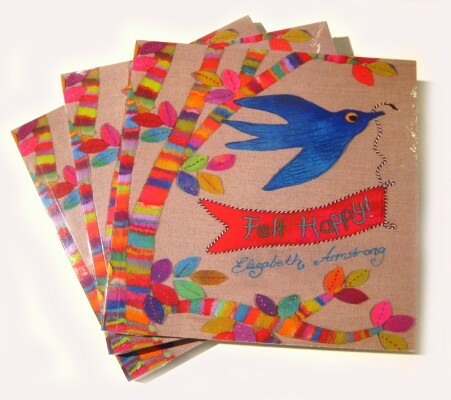 The title is Felt Happy and it’s available in her Etsy shop. Elizabeth’s use of colour is stunning and from what I can see the book reflects that. I’ll be saving my pennies! 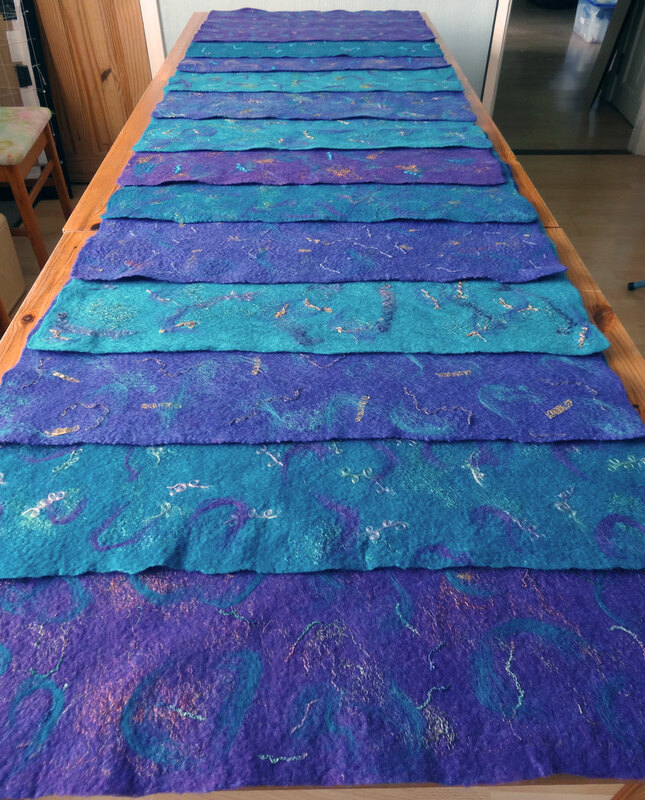 I’ve been working on a big project – big for me anyway – felt mats to form part of the centrepieces at a wedding reception. 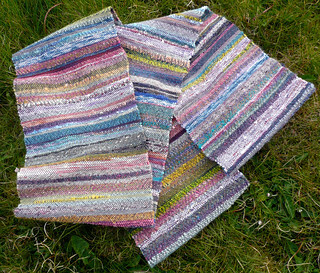 The mats are around 41 x 68 cm each and there are 13 of them! 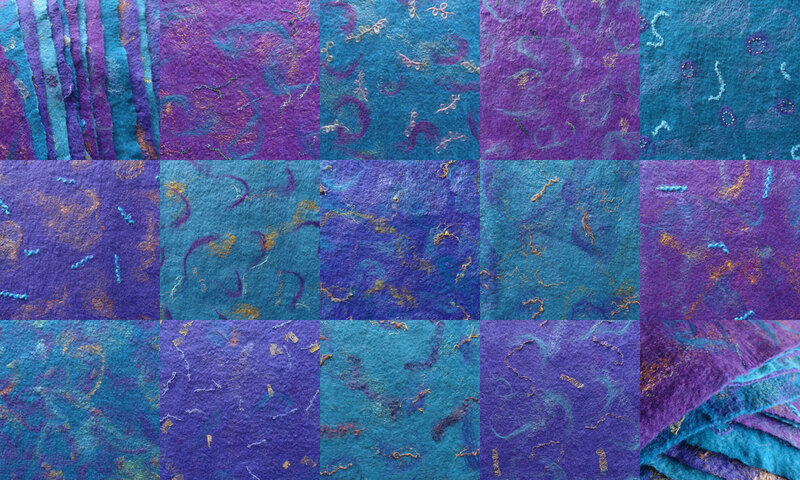 The colour scheme is purple and turquoise with gold so I enjoyed working with those. I’ve managed a rate of about two mats every three days over the last few weeks, fitting them in round other things and I couldn’t have done it without the generous instructions for tumble dryer felting provided by Treetops Colour Harmonies on their web site. I added a couple of notes to myself regarding the process. 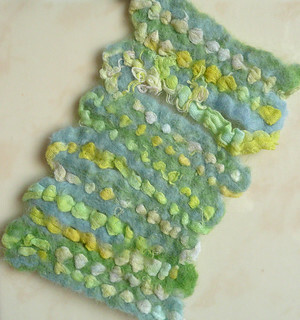 One is to use the biggest heaviest towels that will fit in your tumble dryer for the fastest felting. Another is that when smoothing out the plastic layers between tumbles, if you use the backs of your hands and not the palms the plastic doesn’t drag. 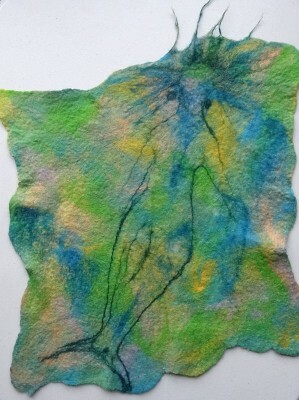 I started off using painter’s dustsheet plastic but found it not very durable and quite difficult to handle. For the size I was working on, cut up kitchen bin liners worked fine and one liner did all the mats and is still going strong. Plastic dustsheets come in huge sizes though so they would be a better option for bigger projects. To keep the size and shape uniform I made samples beforehand and kept notes of the amount of fibre to use for each layer – a good discipline for me. 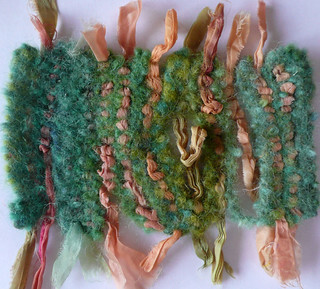 The mats have three plain layers and then the decoration. Each one is decorated slightly differently. I decided early on that it would be good to have something lasting at the end, so the mats are only lightly fulled and still have plenty of shrinkage in them. After the wedding I’ll bring them home and finish fulling them to produce smaller table mats for the bride and groom to keep. I’m committing them to the postal system shortly – wish me luck! 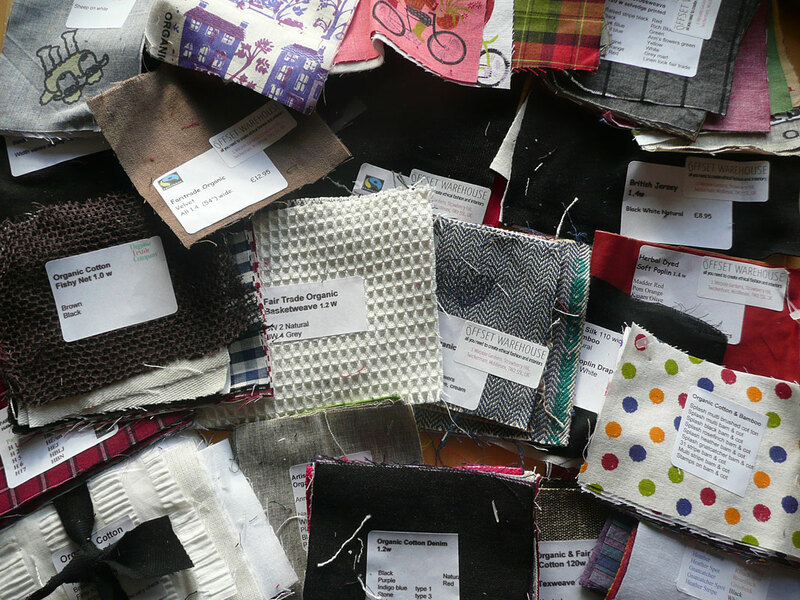 I’ve also done a couple more samples with the withdrawn warp idea. 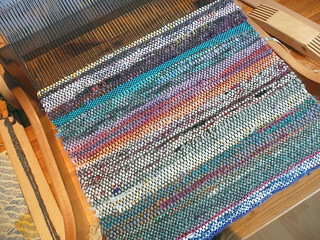 This one could perhaps be called nuno weaving? 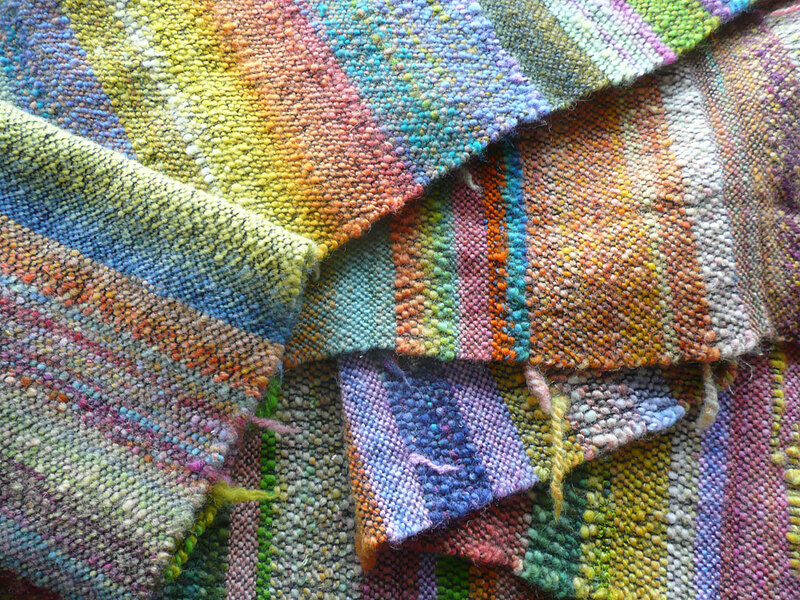 It’s carded merino interwoven with dyed muslin. 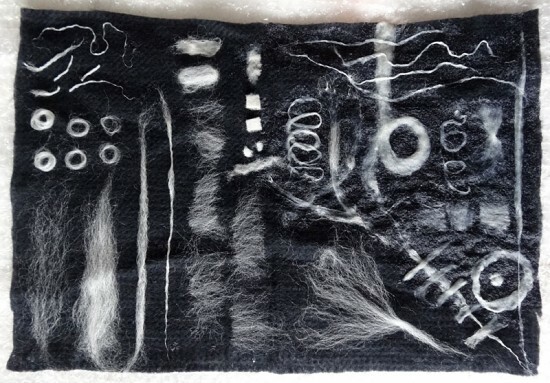 I used monofilament fishing line for the warp and withdrew it after felting by hand. 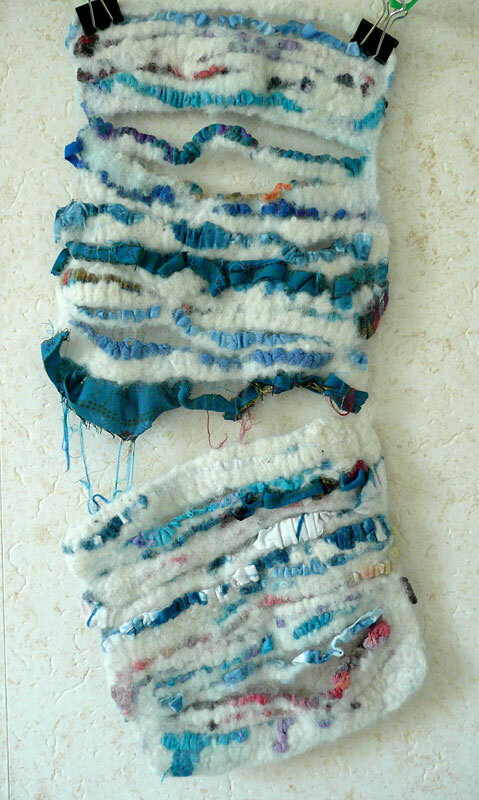 Not very pleasant to work with the fishing line and it wasn’t much easier to withdraw than the hemp yarn I tried first of all. This one is handspun yarn woven with sari ribbon and silk organza on a cotton warp, felted and the warp withdrawn. 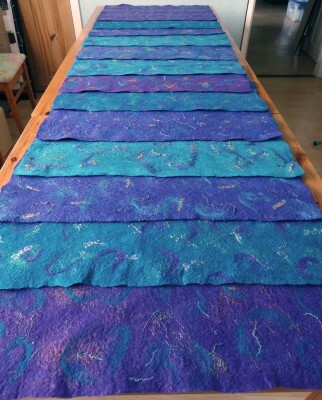 Felted using the tumbler dryer, using this method from Treetops Colour Harmonies, then fulled by hand. I’m not sure where I’m going with this but I’ll just keep playing and see what happens. I’m also thinking about weaving something very open and using it in nuno felt in the usual way. 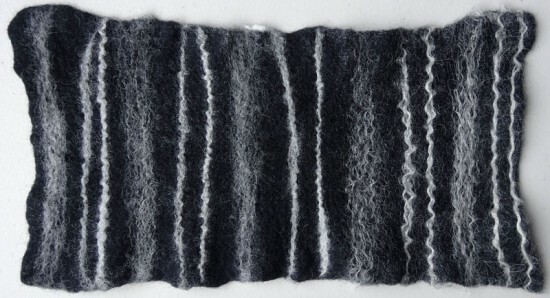 Or in a different way… I got a lovely book in the post yesterday – From Felt to Fabric by Catherine O’Leary. 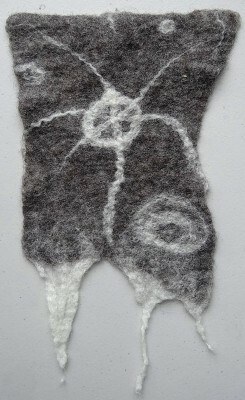 She uses a very inspiring nuno felt technique with what she calls ‘nuno prefelts’. 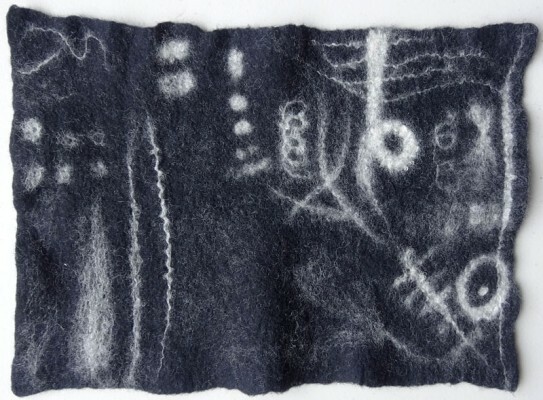 It fits right into my current preoccupation with ways of combining wool and cloth. This week’s biggest achievement was to get my shop on Etsy up and running. I’ve been letting my perfectionism stop me doing this since January, and I’m so glad to have made a start now. 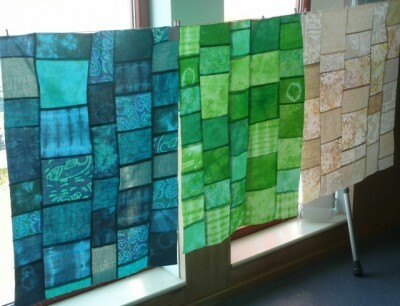 We have another Tiree Tapestry Group workshop tomorrow, finishing work on the backgrounds (twelve of them, in the colours of a Tiree day) and starting working on the main images. I’m helping with the images, so I’d better go and start getting ready!